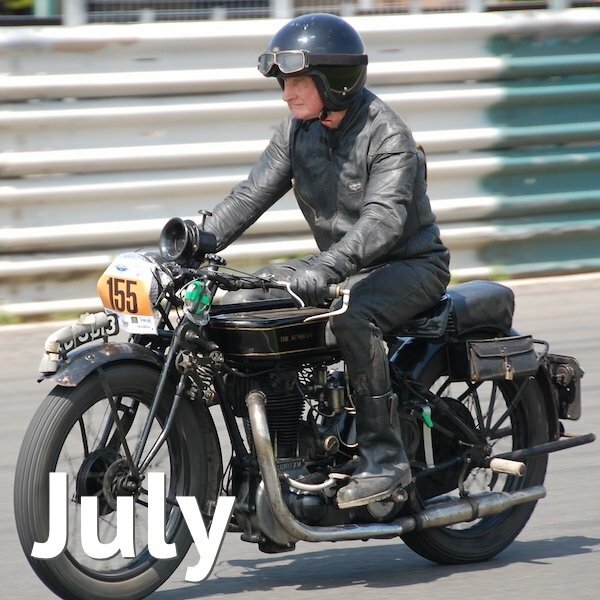 Biker & Bike’s July Motorcycle Events Calendar lists all of the premier motorcycle events in the UK (and quite a few smaller and local ones). If a starting time isn’t shown, please use the link provided to the organiser’s website for more details. All prices are correct at the time of publication, but may be subject to change. Other prices, concessions and early bird discounts may be available. Yes, we know it’s around 95% things with four wheels and you need a second mortgage to do the thing properly (one day is never enough). But if you are a proper petrolhead you can click on the link below and almost smell the exhaust fumes coming out of the screen. The best bit is you get really close to the machines, as you have the freedom of the paddock. It’s that good, it gives you wood. The circus heads into town with ringmaster Jonathan Rea the local hope to take honours in the new race format. For the first time, there are three races to look forward to, with the first race on Saturday and two more on Sunday, including the new morning sprint Superpole Race. There’s a full supporting international race card and races from top national categories too plus the popular Paddock Show, Fan Zone and open paddock so spectators can get closer to riders and their machines. It started last year with a simple call to get more than 20 people to turn up on a seaside run. It ended with a couple of thousand bikes closing down Yarmouth seafront for the day. This year the event is being run in order to raise funds for East Anglian Air Ambulance and if that’s not reason enough to show up we don’t know what is. Starts 10am. This is almost becoming a biker’s national institution if you’ll excuse the pun. We can’t even begin to explain what the National is, except it’s a scatter rally, and neither can the BMF or ACU in a single paragraph, so head on over to this BMF page. Suffice to say, for those that know about it, it’s big deal and a lot of fun. The 4th round in the annual calendar, the Classic Racing Motorcycle CLub’s race weekends are a fantastic way to watch motorsport close up in a friendly atmosphere. As well as watching the always competitive action on the track spectators are free to wander around the race paddock and get up close to the competitors and their wonderful classic race bikes. Each event also features a parade lap. 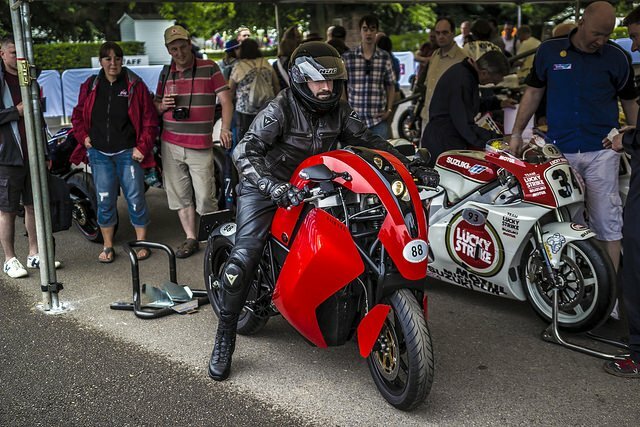 Held annually in conjunction with the Llangollen Railway Classic Transport Weekend, the British Motorcycle Preservation Society in North Wales gathers together an impressive collection of classic and vintage British motorcycles. The Ride of Respect is a mass ride by motorcyclists to pay tribute both to our tri-service personnel and to the fallen and their families The ride is organised by Julia Stevenson and her team. Julia organised the first Ride through taking with her over 15,000 motorcycles and over 22,000 riders and pillions. In 2011 we organised a second ride to show our support to our tri service troops, the townsfolk of Royal Wootton Bassett and also to say Goodbye and Thank you to RAF Lyneham. Over the past 5 years’ rides we have raised around a half million pounds for military charities. Ragley Hall Estate, Alcester, Warwickshire, B49 5NJ. This event has something for everyone interested in adventure and off-road riding. There’s an Adventure Trail plus an Adventure Park where you can test your off-road riding skills. The Adventure Village is where you’ll find food stalls, a full bar, trade stands and live music in the evenings. There’ll be green lane ride outs for you to join, road rides taking in the best of the Cotswolds and test rides on 2019’s new adventure bikes from just about every motorcycle manufacturer including BMW, Yamaha, Honda, Ducati, Triumph, Royal Enfield, KTM, Suzuki and more. The Festival of 1000 Bikes weekend offers every lover of old motorcycles the opportunity to participate at some level. And if not participating, there is something to appeal to the broadest range of ‘classic tastes’. That’s why the VMCC Festival of 1000 Bikes is supported by some of the biggest names in the old bike movement including Footman James Insurance Brokers, Bonhams Auctioneers, Mortons Motorcycle Media, The National Motorcycle Museum, Norton Motorcycles, Michelin Tyre PLC and Ducati UK as well as corporate partner Eriks UK. Prices: Adults from £18, Kids under 16 free. The 6th round of the Championship is at the Snetterton 300 circuit near Norwich. Each Bennetts BSB event also features a busy timetable of regular support races, including the Dickies British Supersport Championship, Hel British Motostar Championship, Pirelli National Superstock 1000 and Pirelli National Superstock 600. No firm details yet but previous shows have had serious bike displays going back through every period to the pre-First World War era, many of them historically important. In previous years, six times World Champion and six times Isle of Man TT Winner Jim Redman has made regular appearances and he’s always worth your time. Lincolnshire Bike Week 2018 sees Coastal Events CIC supported by BMF & MAG on this week-long family-friendly motorbike themed event. A full 7 days of Bike Nights, Beach Races, top bands, camping, ride outs, track days at Cadwell Park and so much more all based on the Lincolnshire Coast. A trove of motorcycle treasure, from parts to tools, clothing and bikes for sale. At least 250 indoor and outdoor stalls feature parts and services from specialists, so you can get a petrol tank hand painted, a digital speedo for your new wave retro build or the latest cleaning materials. Club displays normally often place in the large indoor hall. Teams raise funds for their favourite charitable organisations. Each team can consist of up to four riders who aim to complete as many laps as they can around a specially prepared Motocross track for 5hrs. Each team are using mopeds and scooters which have engines of up to 90cc’s! These events push the limits of man and machine! Serious fun this. Modern and classic road racing in a town centre Victorian park, with stalls and more to keep you occupied between the races. 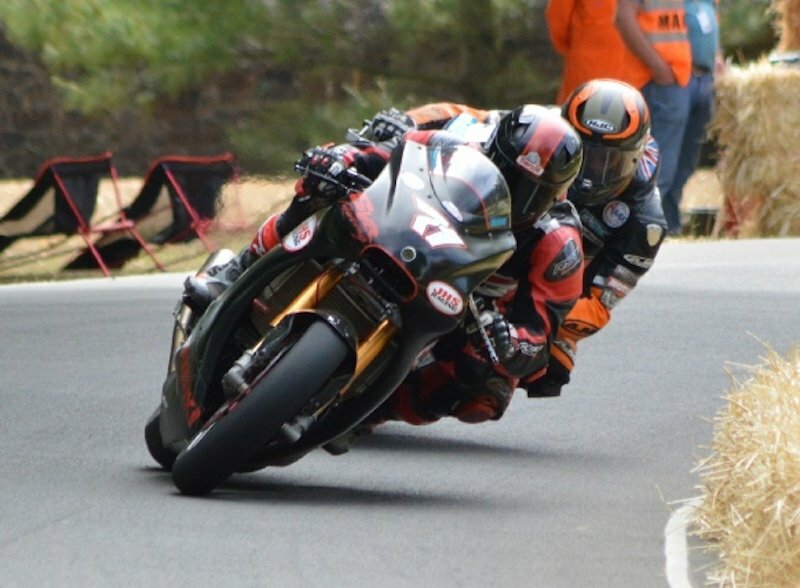 Popular with the TT crowd (John McGuinness raced in 2016) this has been a stalwart road race event since the 50’s, with the likes of Surtees, Hailwood, Foggy and Phil Read taking part. Adventure explorer Zoe Cano will also be along this year, proving it’s not just about sporty bikes. The second of the three Cheshire Classic held over three months each summer, with the final event held in August. Four-wheeled vehicles dominate but there is still plenty to see for those of us into two wheels, including displays, trade stalls and autojumble. As with all events from Classic Shows, if you turn up and display a pre-2004 motorcycle the entry price is reduced to just £3 (maximum two people per bike entry). Prices: Prices: Adults £8, kids 7-14 £3, under 7’s free. See and hear some of motorcycling’s historic race bikes as they are fired up and brought to life around the famous Ingliston circuit, Scotland’s oldest surviving racing circuit. See a display of iconic race bikes and the most important and influential road bikes. The massive retail zone offers bargains on clothing and accessories alongside new and exclusive products. Live acts already confirmed include the infamous Purple Helmets and Stunt Bike hero Kevin Carmichael. Camping and entertainment are also available. Now firmly established as a must-do event in the new wave custom scene, this madcap event is a true celebration of ‘built, not bought, then spanked down a grass track’. Competition events include the original Malle Mile, hill climb, electric bikes, kids and women only races. There’s also a display of custom bike builds, bands and an after-party, all set in the beautiful grounds of Kevington Hall. See our full review when we visited the event in Summer 2018. 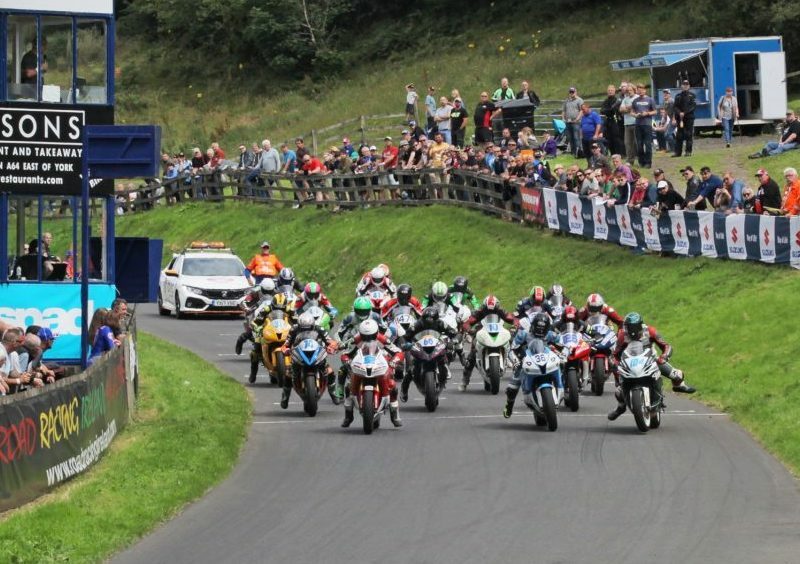 Classic bike racing returns to Oliver’s Mount following a year off for this historic track, the only public road racing circuit in the UK. The Barry Sheene Festival often features the legendary rider’s championship-winning bikes and there is always a feast of classic racing machinery and memorabilia on view around the paddocks. Spectators are often only a few metres from the superbly tight racing which weaves for 2.43 miles around the hillside, only half a mile from Scarborough’s town centre. The Calne Bike Meet claims to be Europe’s biggest (better not tell Hastings, who claim 10,000 to 15,000 bikes), with over 5,000 bikes, historic and modern, plus owner’s club stands, shows, stalls and bands. There’s lots here if you are into veteran, vintage and classic bikes and you’ll get into many pipe-chugging chats with marque club members. At 5 pm there is a 40-mile ride out to close out the event, taking in the surrounding picturesque towns and villages of Wiltshire. We are gearing up for an even bigger event this year! 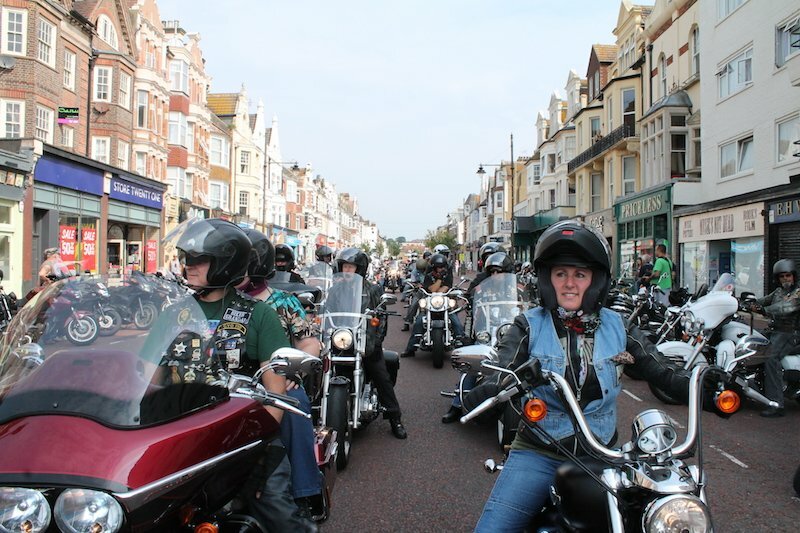 Over a thousand lady bikers are expected to gather at Lynn’s Raven Café in Whitchurch from 9 am on Sunday 29th July in a bid to beat their existing world record of 618 which has yet to be broken! There will be a few stalls plus sales of raffle tickets, lanyards and event stickers to raise funds for our sponsors chosen charity/charities. Gents are of course welcome as well as spouses, partners, kids, parents & family members but only female riders will be counted for the record. After a successful launch at Donnington last year No Limits are switching their endurance event to Anglesey’s International circuit. An exciting race is in prospect, long distance contests providing a massive challenge for competitors. The paddock will be open throughout the event, allowing spectators to see the bikes being prepared before and during the race. Set against the seaside backdrop of the iconic art deco De La Warr Pavilion BEXHILL MotoFest 2017 is bigger and better than ever. For 2017 BEXHILL MotoFest have teamed up with Swinton Insurance to bring Spectacular stunts to the De la Warr car park with Motorcycle stunts International and Stunted Reality, a Zona Italia to welcome the Ducati owners club and all riders of Italian iron, a Harley Cavalcade and a Goldwing Cavalcade will be hitting town at about 10.30am – The Ride to the Music festival on the seafront terrace of the De La Warr Pavilion is headlined this year by STONED – probably the best Rolling Stones tribute band in the southeast. There will also be traders and exhibitors from all aspects of the motorcycle industry as well as a family funfair and unique RIDE THE FUTURE electric bike exhibition. Bikes will be display parked throughout the town and a wide range of food and refreshments will be available from over 50 Cafes, restaurants, pubs and bars. Held every year on the last Wednesday of July, the Gawsworth Jesters Bike Night attracts over 500 bikes that spread out along the lanes around the Harrington Arms pub. There are no official displays – it’s just a meetup – but a fairly big one at that. Unless there is a significant show element involved, we haven’t listed every autojumble and swap meet in the Motorcycle Events Calendar. 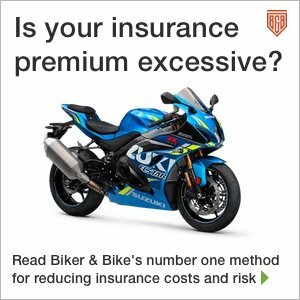 Likewise, unless there is a hefty bike activities element, we haven’t included many club rallies or biker-only music festivals, unless they’ve got a great reputation. This is mainly a list of the larger or more specialist bike-focussed events, plus we’ve added in the major sports bike race events. All prices are on-the-gate prices for a single day visit, unless otherwise stated. Other ticket prices may be available in advance, as well as concessionary prices. See event websites for more details. If your event isn’t listed in the Motorcycle Events Calendar, let us know via the Contact Us page, using the ‘editorial’ email address and putting the words Event Listing in the subject line of your email.